The Banqueting House is the only surviving part of the medieval Palace of Whitehall, which was otherwise destroyed by fire in 1698. Its simple Palladian design became increasingly admired in the 19th century, when such designs became fashionable again. 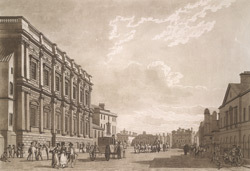 As can be seen in the print, it was striking both in its size and style compared to the other buildings in Whitehall.